10227 B-Wing is a Classic Star Wars set released on October 1, 2012. 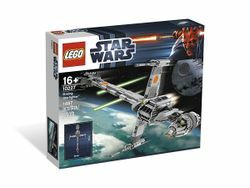 It contains 1486 pieces to construct a model of the B-wing Starfighter. A teaser for this model was shown in the Winter 2011 Catalogue, in the background of an image of the Super Star Destroyer. This is the third Rebel fighter to be made into a UCS model. A preview model of this set was shown at Brickfete in Toronto. This model was on sale for $99.98 for the May 4 ("May the 4th be With You") promotions in 2013. This page was last edited on 9 January 2016, at 00:38.